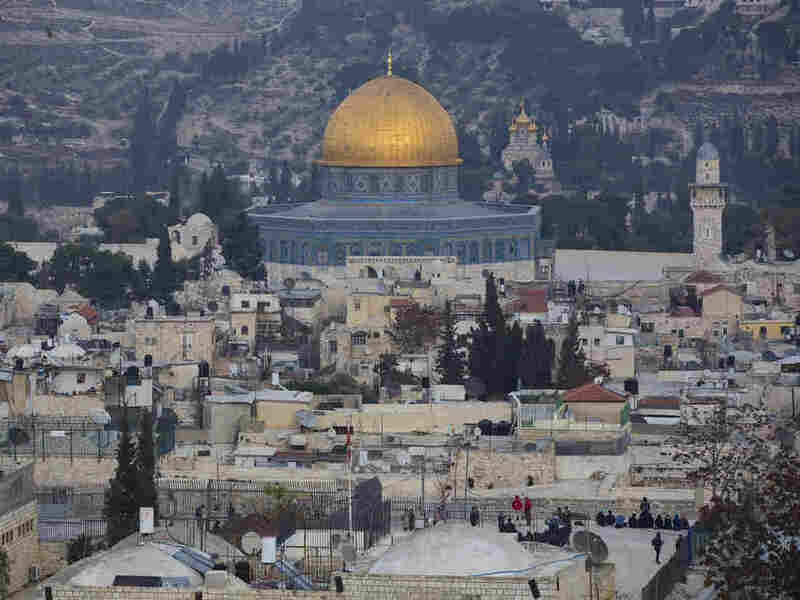 Understanding The Map Of Jerusalem, Or Trying To : Parallels The move on Monday of the U.S. Embassy from Tel Aviv to Jerusalem endorses Israel's view of the city — where it has reshaped the map to solidify its hold. A view of Jerusalem's Old City. It puts the U.S. in a distinct world minority. The U.N. General Assembly, by a vote of 128 to 9, condemned the move last December. Most of the world's governments do not recognize the city as either Israel's or as the Palestinians'. And even the Trump administration, while it's making the move, says the actual borders of the city are still subject to negotiation — maybe the Palestinians, who make up 38 percent of the city's population, can still have part for their capital. Here's how complex the situation is: The State Department said it would list the address of the embassy as Jerusalem, Israel. But on passports issued to U.S. citizens born there — at least as of last week — the place of birth still reads simply "Jerusalem," with no country. That's been the practice for years. What's clear is that both Palestinians and Israelis live in the city and have deep historic and religious ties there. And it's been a flashpoint. The western side of the city is home to Jewish Israelis and Israel's government. It's not really contested and would be expected to remain with Israel in any peace talks. The eastern side — including key Jewish, Muslim and Christian holy sites — was captured by Israel in 1967. It's populated by Palestinians who seek it for their capital. Israelis are increasing their numbers there and it's highly contested. Here's a map that lays out major sections of the city. The boundaries have names like the "Green Line" and the "separation barrier," but not "border." To start unraveling this, follow the Green Line. That line, sometimes straight, sometimes in squiggles or confounding loops, separates the territory that Israel and Jordan controlled when an armistice was signed ending the 1948-1949 Arab-Israeli war shortly after Israel's creation. Source: Map data by Daniel Seidemann/Terrestrial Jerusalem. Labeling by NPR. Before that time, Jews and Arabs lived throughout the city. With the end of the war, fences went up and Israelis were in west Jerusalem, Arabs in the east. The walled Old City was under Jordanian control; Jews were expelled from the Old City's Jewish quarter and were barred from the Western Wall, the holiest site for Jewish prayer. Palestinians abandoned homes in the west as they fled to the east. The Green Line had its quirks — it wrapped around areas that were not entirely claimed by the Israeli and Jordanian sides. One of the areas, just south of the Old City, is referred to as the U.N. zone on this map — its areas were subdivided between the U.N., Israel and Jordan. Today it's all under Israeli control and is where the U.S. built a consular building — now to serve as its embassy. According to Daniel Seidemann, an Israeli lawyer who has opposed Jewish settlements in east Jerusalem and briefs U.S. officials about the city (and whose mapping was used as the basis of the maps on this page), the U.S. consular building sits on what had been the Israeli part of this sort of no-man's land. Part of it also rests right on the Green Line and extends into western Jerusalem. In the 1967 Arab-Israeli war, Israel captured the eastern portion of the city from Jordan. It still holds it now, and Israel considers it part of Israel. But in the eyes of the U.N. and nearly all governments, it's seen as occupied territory. The U.S. consular building, to house the embassy on Monday, is not on occupied territory, because it does not sit on land captured in 1967. The next controversy these maps highlight is the population mix in the city. Since 1949, the western side of the city has been populated almost entirely by Jewish Israelis. And Israel has encouraged the growth of Jewish neighborhoods in the eastern side of the city, amid the largely Palestinian population. (You see those in the map's blue sections in east Jerusalem). A partial view taken on April 30 shows the U.S. consular building in Jerusalem. Israel also took control in 1967 of the Old City, where Jews have returned to live and to pray at the Western Wall. Palestinians also still live there and come by the thousands each week to pray at the Al-Aqsa Mosque complex on the hill above the wall. With the status of the city unresolved, Israelis who move to occupied areas of eastern Jerusalem are seen by most of the world as settlers. Israel, not recognizing the city as occupied, rejects that label. Palestinians say Israel is using settlers to divide their neighborhoods and diminish the Palestinian presence in the city. A new line has been created over the last 15 years or so. Israel's separation barrier — a wall in some places, a fence in others — was built to stop Palestinian attackers, according to Israel, which says it's for security. The Palestinians see it as a land grab, taking more territory the Palestinians seek for a future state. In general, the barrier travels on or near the eastern edge of Jerusalem, though there are a number of exceptions. It means thousands of Palestinians have to pass through checkpoints to get in from the city's fringes. One more shape-shifter on these maps: The Jerusalem city limits are much bigger than they were after the 1949 war. Israel has enlarged the boundaries since then, including both Jewish and Palestinian neighborhoods within the expanded city limits. And since Israel declares sovereignty in the city, Palestinians see the growth through their areas as a way for Israel to claim more territory. Even with the support President Trump has given Israel's claim to the city, he might still unveil a peace plan that would ask Israel to give up some of the Palestinian-populated areas to Palestinian control (or even a future state). That would be a concession by Israel. Lately some Israeli lawmakers have proposed unilaterally removing some Palestinian neighborhoods from Jerusalem's boundaries as a way to strengthen the Jewish majority in the city. An earlier version of this story called the building where the U.S. Embassy will be located a consulate. 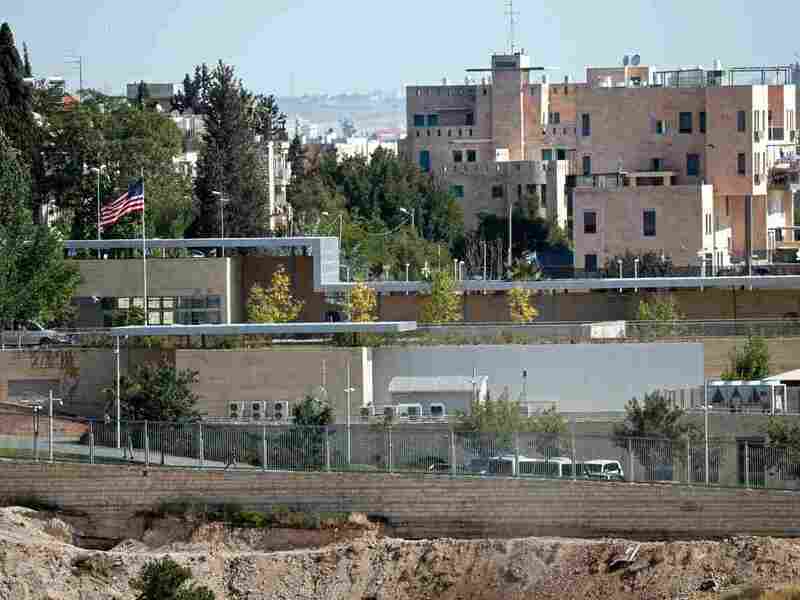 It is a wing of the U.S. Consulate in Jerusalem, which is at a different location.